What is the constitutional path to independence? 2013_09_11_JorgeLizana_Via Catalana Cuidadela7 by Fotomovimiento, on Flickr. There is a school of thought that the independence referendum is happening too soon, before the Scottish public has been fully convinced of the merits of the prospect. However, a number of events (a capable SNP government and a useless opposition at Holyrood, a major recession, the collapse of the LibDems in Scotland due to their Westminster coalition with the Tories, and a Westminster government that didn’t understand Scottish public opinion) together created a perfect storm that gave us first an SNP majority in Holyrood and then Westminster’s acceptance of a referendum organised by Scotland. Now that we’ve got the chance to be sovereign again, we need to grasp it with both hands because the opportunity might never arise again. If the referendum ends in a No, I’m not so sure. Of course we’ll all accept the result and try to make the best of it at first, but having talked about how much Scotland will be able to achieve as an independent country, it will be very difficult to abandon the dream completely. The SNP might lose a few disillusioned voters, but on the whole I expect the party to survive and keep the flame alive. Also, given likely subsequent developments in the UK, such as leaving the EU and getting a Tory government supported by UKIP, I wouldn’t be surprised if large groups of Scots would soon bitterly regret their No vote in the referendum. However, even if in ten or twenty years’ time everybody in Scotland agrees that it was a terrible mistake not to vote Yes in 2014, circumstances might be less favourable. Oil might be running out (or be banned due to global warming), Westminster might have decided to invest in nuclear power instead of Scottish renewables, the Scottish Parliament might have been declawed and defanged, and the UK might have succeeded in dismantling the welfare state everywhere to such a degree that restoring it and extending it (as suggested by the Common Weal project) would be completely unrealistic. Even more importantly, would we ever be allowed to hold an independence referendum again? Even if pro-independence parties gained an absolute majority in the Scottish Parliament once more (which is not an easy thing to do, given the electoral system used), would Westminster really cooperate? We shouldn’t forget that David Cameron only agreed to the referendum because he thought it would lead to a quick and decisive victory for the No side, which would have buried Scottish nationalism for a generation. If Scotland then decided to organise a referendum anyway, it’s very likely it would be deemed ultra vires, especially because Westminster will interpret the Edinburgh Agreement as a concession by the Scottish Government of sovereignty/authority — in other words, there would be a legal precedent that the Scottish Parliament should seek approval from Westminster before holding an independence referendum. If the Scottish Government tried to organise a referendum after Westminster and the courts had decided it was illegal to do so, we’d get into a Catalan scenario, and that’s not a pleasant thought. 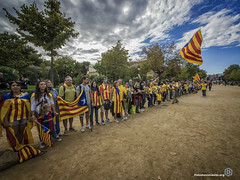 It might look very romantic when you look at their 400 km-long human chain and all that, but this article calculates that the chance of an amicable divorce there is just 14.8%, and it emphasises the risk that the police and perhaps even the military will be deployed by Madrid to keep the situation under control. Hopefully things wouldn’t get that bad in Scotland, but the danger would be there. We have a unique opportunity in September. We can vote Yes knowing that Westminster will respect the result, and it can all happen completely peacefully. However, it might be our one and only chance to do so. Nobody should vote No because they don’t think the time is ripe yet. This is probably the best chance we ever get. I think there is a real possibility that the unionists will use a NO vote to alter the constitution in order to make any further votes a lot more impossible, vis a vis the Catalonian situation where the Spanish constitution explicitly prohibits such activity. SO I would expect explicit legislation being brought forward to lock Scotland into the UK. Because of the absence of a codified constitution, I’m not sure they’ll take such a step. I believe the devolution legislation already states that this type of referendum needs approval from Westminster, and they’ll just make sure never to agree to one again.